Anjezë Gonxhe Bojaxhiu, better known as Mother Teresa, was born in 1919 in Skopje (present-day Macedonia). At the age of 18, she moved to Ireland and joined the Sisters of Loreto. 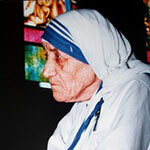 She became a missionary in India in 1929 and established a religious congregation, the Missionaries of Charity, in 1950. In 1979, she received the Nobel Peace Prize for her work to overcome poverty. Argentina’s National Solidarity Day was declared in honor of Mother Teresa. It is the holiday of all people who dedicate their free time to helping those who need it. It is marked with events organized by social organizations, religious communities, educational establishments, and volunteers. According to Father Fabian Nieva, advisor to the Catholic social service organization Caritas Internationalis, people in Argentina are increasingly embracing solidarity as a virtue. At the same time, it is important to emphasize that solidarity should not be practiced only in extreme situations, such as natural disasters. It should be part of our everyday attitude. And the best way to take the first step towards this is to participate in National Day of Solidarity.